Since the Second World War, Australia has been one of the world's largest agricultural exporters, and this has fueled the demand for agricultural aircraft. With a large number of surplus military aircraft becoming available just after the war, it was almost inevitable that attempts would be made to convert some of these aircraft for agricultural use. 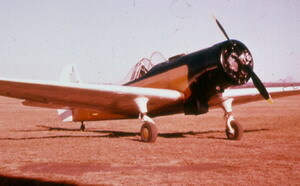 The KS-1 was a post-WWII conversion of the CAC Wackett Trainer for top-dressing and spraying. The chemical hopper was placed in front of the pilot, replacing the original front cockpit seat. Following many trials and tests a number of modifications were included, resulting in the KS-2. However, even in this modified form it did not meet the requirements of agricultural operators who tested it, so the sole prototype was developed further to become the KS-3 Cropmaster. 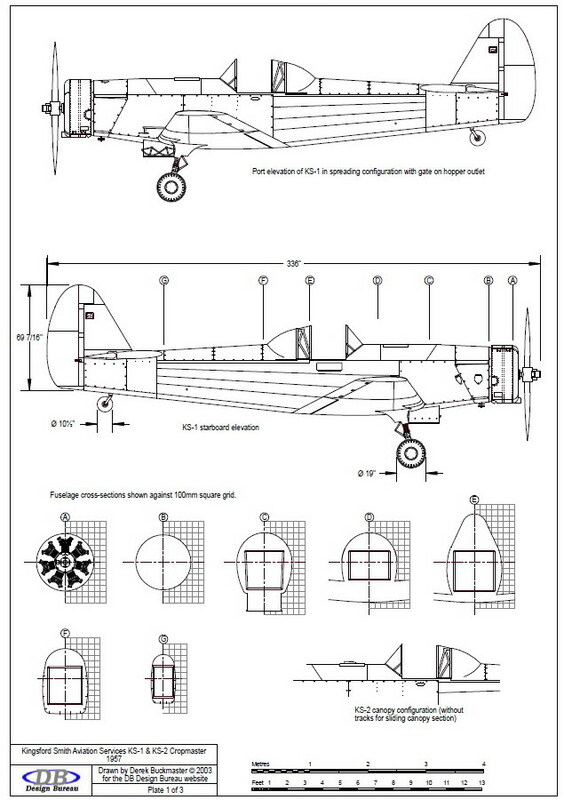 This is a series of drawings providing details of both the KS-1 and KS-2 (which differed externally only in minor differences around the cockpit). 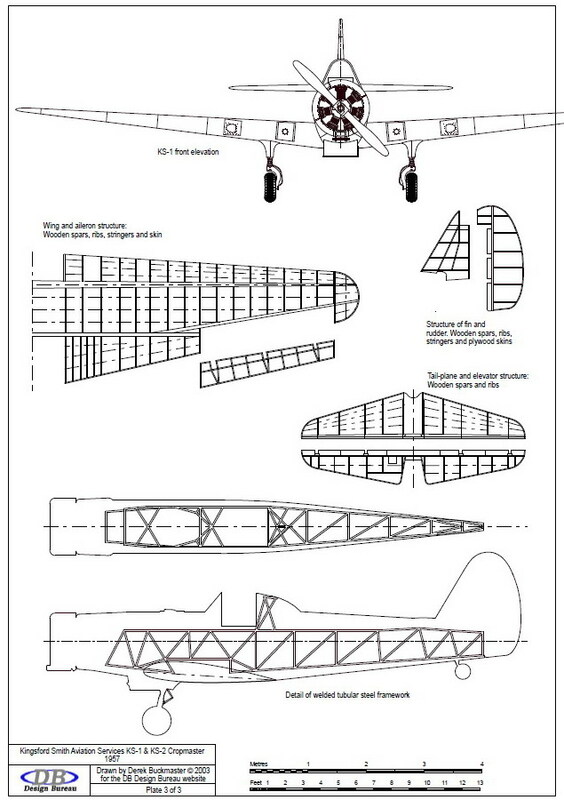 The first plate shows side elevations and fuselage cross-sections. It also shows a scrap-view of the KS-2 cockpit section (the only visible difference between the KS-1 and KS-2. Click on the thumbnail to open a PDF file formatted for printing on A4 paper. 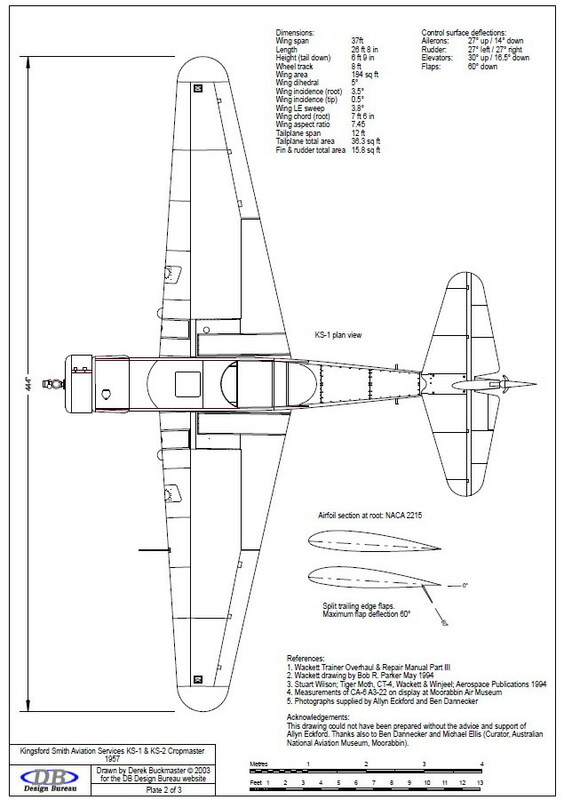 The second plate shows a plan view of the KS-1. Click on the thumbnail to open a PDF file formatted for printing on A4 paper. The third plate shows a front elevation of the KS-1 and structural details (common to the KS-1 and KS-2). Click on the thumbnail to open a PDF file formatted for printing on A4 paper. If you download these drawings, you agree to use them under the Creative Commons Attribution Share-Alike 3.0 Unported License. Click here for a full description of this license, but in summary it means that you are free to copy, distribute and adapt these drawings on the conditions that you attribute their creation to me and that if you adapt and distribute them you must also license the adapted versions under the same conditions. You may seek my permission to waive any of these conditions (if, for example, you wish to publish the drawings in any form) by sending me an email.